Not since Moses was given Torah (the Law) has there been so many people who knew the Law but were so far from it. Including most who call themselves believers. They will be staying for the Tribulation. It is this distance between people and God’s Law that the Bible means when it speaks of lawlessness in the Last Days. This is the very thing causing the love of people to grow cold. The natural human affection that people have for each other has been dwindling rapidly for years. Now the last of it is about to vaporize as the Bride of Christ is taken from the earth, and the remaining believers will become offended. Not just offended at God – just offended. The Bible speaks of perilous times in the Last Days. Two of the main things that make them perilous is that men become lovers of themselves and lovers of money. We can see this in every area of the world and in every aspect of society. Self love, which is another word for selfishness, is what makes the days dangerous. Instead of loving God and loving His people – people love themselves. All of your life decisions flow either from your love of God or your love of Self. We’ve all heard the parable of the sower many times, but do you know what the main point of it is, what it’s all about. It’s about four different kinds of soil and their response to a Seed. The exact same Seed was put into each soil, there was no difference in the Seed. No difference at all. The difference was in the soils (which as you know) represented the human heart. Three were bad, one was good. You could tell what kind of soil it was by the way it responded to the Word. All of human history is divided into two parts: before He came and after He came. The first time Jesus came it was as the Lamb of God to sacrifice Himself for the sins of the world and offer Grace to any who would have it. In the 2nd coming He comes as a Lion to punish the enemies of God, which are simply those who did not believe Him and those who do not keep His Word. The gospel must be preached in the Light of His 2nd coming. For almost 2000 years, it has been preached in light of the first time He came. The second will not be like the first. Wrath is just a word that means anger. There is a wrath being poured out on the earth right now in the form of the curse, and the Bible talks about it at length. It came about because of the fall of man. Most people live in it, but all believers are delivered from it as long as they stay in God’s Blessing, by obeying His Word. Wrath in this first sense is not something God has to put on people. It’s simply what happens outside of His Blessing. When a believer sins he steps into the curse, the gale of God’s Wrath that the rest of the world lives in all the time. When you stop obeying you exit the Blessing. People don’t like that, but they need to read the Bible. It is filled with many promises and great blessings. Every one of them are conditional. Every single one. Now there is also a Day of Wrath which will come upon every one who has not believed God or kept His commandments, which occurs after the Tribulation at the return of Christ. The Bible calls it a literal day many times throughout Scripture, so there’s no reason to think otherwise. But one thing I want to make as clear as I can, is that the Day of God’s Wrath is not for believers. Even if it occurs during the tribulation it will not happen to believers who go through the tribulation. The wrath of God in that sense is one of the things that all believers everywhere are delivered from. There is one more wrath I’ll get to in a minute. Though many Christians will be going through the Tribulation, not one will go through the Day of wrath. Those who preach pre tribulation combine the two in an attempt to justify their argument that believers will not be going through the Tribulation. In other words, they know the Bible says we’re saved from the wrath to come, so they just say the Tribulation is the wrath, so we don’t have to go through it. The Bible doesn’t say that – they say that. I taught post tribulation for the first 20 years of my ministry, that believers will be going through the Tribulation. But that’s not completely correct either. The truth is – they’re both right. In that, there will be followers of Christ taken out before the Tribulation, and there will be followers of Christ going through it. But the Scripture makes it clear that no believer will be going through the wrath of God. Some things are made very clear in just a few Scriptures, others can be only partially seen even when you look at all of Scripture. Some translations use the word trouble or distress in place of tribulation, but what it is is a time of testing. It will be a trial for everyone who lives on the earth. We say trial by fire, which is actually from the Bible. Well, this is trial by tribulation. The Bible tells us that Jesus learned obedience through the things He suffered. This time of trouble will separate all those who say they believe in God from those who really do believe in God. Because the ones who end up staying and really do believe are going to have to hold on – tight. It’s going to get rough, everywhere. The Lord himself tells us that there have never been days of difficulty like these days in the history of the world, and there never will be again. 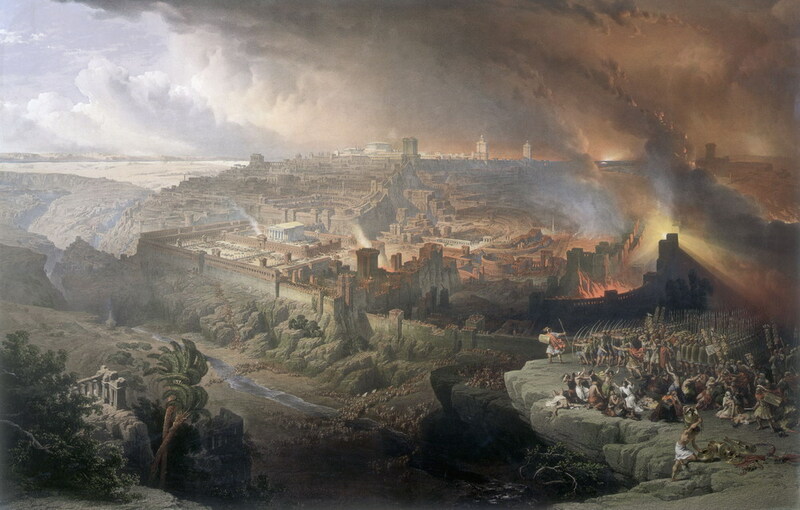 In 70 A.D. when both the Temple and Jerusalem were destroyed, not even a generation after Jesus had prophesied it – more than a million Jews died during the destruction. No fewer than 600,000 who had died of famine within the walls, were counted by the Romans as their corpses were thrown out the gates. The surrounding valleys were filled with their bodies, like so much earth. Of the survivors 97,000 were sold as slaves at paltry prices; 40,000 of which were freed because nobody bought them. The commanding general Titus groaned and threw up his arms in horror and called God to witness that he was not responsible. He was the eldest son of the then emporer Vespasian, and it had never been their plan to destroy the Temple. The sacking of which funded the completion of the Roman Colosseum. It would seem one man’s destruction is another man’s entertainment. Titus refused to accept a wreath of victory, as he said that he had not won the victory on his own, but had been the vehicle through which their God had manifested his wrath against His people. These days of tribulation will be worse than those days. You won’t want to be here. But then, you don’t have to be. The thing that will separate those who leave with Jesus for the Marriage Supper of The Lamb and those who stay for the Tribulation and a second chance to get it right is – how much they actually followed Christ. How much they meant it. Many have become believers with the exact same intention of some wayward young men choosing between jail time or the military – that of avoiding prison. Well Hell is a spiritual prison. God does not consider it some great act of love to choose Him over going to prison. Yet for millions of Christians, that’s as far as their intention on being Christian went. Many will make it to Heaven, but they will not be the Bride of Christ. The true ecclesia is the Bride, and only the Bride makes it out before the tribulation. Parables are allegorical, which simply means there is a hidden meaning within them. None of the Disciples spoke in parables, only Jesus did. Which is completely acceptable as He is His Father’s Son, and in them He is speaking of His Father’s Kingdom. Which is so much bigger and brighter than anything we can understand in our current state with all of its limitations. Thank God it is said in such a way that we can get it – if we want to. If you don’t want to get Him, well then what He is saying is hidden from you. God’s Truth is hidden like this all throughout Scripture. But it is not hidden from us who Believe, it is hidden for us. In the parable of the wise and foolish virgins who were waiting for the groom to show up, 5 went with the groom to the marriage supper and 5 were left behind. In this one, the virgins of course represented believers who were keeping themselves pure. A virgin is someone who is sexually pure. It did not say the 5 who were left were not virgins, or that they were not waiting. It said they were not ready. The difference between those who went and those who stayed was that the ones who went were ready when the Master showed up. They were prepared to wait by having their vessels filled with the oil needed to keep their Light shining. Well the Bible says that the world and all its ways are darkness, that all Christians are called to be a Light and that we need the oil of the Holy Spirit to be a light. On a daily basis. To know what the Lord is looking for when He returns you have to go back to what He preached. Jesus preached two things during His entire ministry on earth. He preached Repentance and Kingdom. Repentance means to turn completely around, to change the way you think and act. Well most who call themselves Christians have not done that, but they want to get in The Kingdom anyway. Well a kingdom is not some enchanted mystical idea where you can come and go in what and how you please. It’s not a democracy. It is the dominion of the king. Kingdom is the realm in which the King’s will is being done. Well God created the entire Universe, but His will is not being done everywhere. All of us need to change the way we think and act to enter His Kingdom. Many have changed, but most have not. Do you know why there is no crime or poverty or cancer in Heaven. Because God’s will is being done there. Heaven is a part of His Kingdom, but it is not all of it. So when you see a will being done that is other than God’s will, all you need to know is that is not part of His Kingdom. The fallen nature hates the simplicity of spiritual truth because it takes away all the hiding places. Why will so many people from all over the world be following the Antichrist in the days to come. The more Ignorant you are of the Bible, the easier you are to fool. In the spirit realm you are always yielding to what you’re not resisting – and resisting whatever you’re not yielding to. So that you are always doing both at the same time, to different things. As a result of the fall we have a divided nature, and you must choose which one to side with. Your life is a result of the choices you’ve made. It’s no mystery why some will be going with the Lord before the tribulation and some will be staying to go through it. Choosing is an act of the will, and your will is part of your soul. If you line your soul up with your body, that’s being carnally minded and it leads to death. If you line your soul up with your spirit, that’s being spiritually minded and leads to life and peace. There is no neutral plane where you’re not doing this. Inside ourselves, we are always moving closer to God or moving further away, but we are never standing still. That’s why coming to Him daily, and throughout the day is so important. Those who come to Him daily are the ones who overcome. The coming Rapture is not for believers – it is for the Overcomers. Those who believed God enough, and proved it by obeying Him enough, to overcome the obstacles in their own personal life that were blocking them from entering in to this highest level of promise and reward. Those who are ready for Him to come. These are the ones who meant it. Those for whom Faith was not some vague idea, but a lifestyle of learning to trust Him while keeping the expectancy of His return alive. It has always been wide open to anybody and everybody who wants to get in on it. Don’t believe me, Jesus himself says it again and again in Revelation chapters 2 thru 4, at the end of the letter to each of the 7 Ecclesia. He who overcomes, to him who overcomes, to him who overcomes. In chapter 3 verse 10, He speaks of keeping those people who stuck to keeping His Word – from the hour of trial that will come upon the whole earth to Test everyone who lives on the earth. Which simply echoes and is a reference to what He said in Luke 21:36. While warning all believers to stay alert and be ready for His return He speaks of the trial that is coming to the whole world, and tells how to get out of it. In doing so He foretells of the rapture. Avoiding this coming trial is only possible for those who judge themselves and keep free of the anxieties pressures and carnality of the world and of this life. He tells anyone who wants to know how they can escape. It is the only one offered. That is the cost here and now for not going through the trouble then. Going through the trouble now of putting your Flesh down, dying to your fallen nature. The crucifying of Self with all its demands and desires. These are the Overcomers. Jesus commanded it. But most have not done it. There is a suffering in following Christ at the highest levels of faith and obedience, but it’s not from cancer or poverty. God does not have those things. The suffering is in not getting your way, not living for yourself. Jesus said if we tried to save our life in this world we would lose the life He has for each of us in Eternity. But if we would lose our life in this world by pursuing Him and the life He has for us, we would save the life that He has for us in eternity. Remember that the Lamb’s Book of Life is something that names are taken out of, not added to. When this all started every name was already in the Book of Life. We already know from the Word that many will be offended in the Last Days, and that even the love of the great body of believers will grow cold. The nature of man loves religion but it will not be made godly, it denies that you can be. That’s why the earth is filled with billions of religious people, but so few who know God. You have to have the help of the Holy Spirit just to want to be made like Christ, then you need more of that same help to become like Him. The only people who Do what Jesus says are those who believe He is real. Not those who feel He is real, those who believe. Do the people you spend the most time with love God. Do they know His Word. If we are commanded to live by Faith do you know any who do – do you hang around them. Govern the amount of time that you spend with people or groups of people according to how much you want to be like them. The consequences will be eternal.